Salmonella is a member of the family Enterobacteriaceae. It is a Gram-negative bacilli, motile and non-lactose fermenter. The genus can be divided into two species (S. enterica and S. bongori), based on their phenotypic profile. It causes acute gastroenteritis and when Salmonella infections become invasive, they can affect the bloodstream (bacteremia), bone (osteomyelitis), joint (septic arthritis), brain, or nervous system (meningitis). Salmonella bacteria are classified as either “typhoidal” or “nontyphoidal,” based on their serotype. Typhoidal Salmonella refers to the specific Salmonella serotypes which cause typhoid fever or paratyphoid fever, including typhi, paratyphi A, paratyphi B , and paratyphi C.
Nontyphoidal Salmonella refers to all other Salmonella serotypes. Bismuth sulfite agar: Salmonellae produce black colonies. 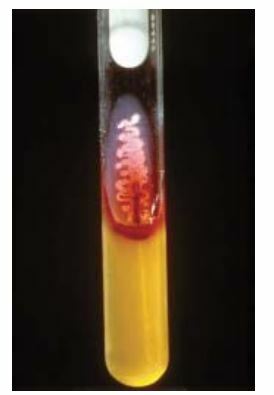 Deoxycholate Citrate Agar (DCA): Salmonella appear as pale colonies. Salmonella-Shigella (SS) Agar: Used for selective recovery of Salmonella from stool culture (contains five times the concentration of bile salts compared with MacConeky Agar). Salmonellae usually produce lactose non-fermenting colonies with black centres (except S. paratyphi A, whose colonies do not have black centres). Hektoen Enteric (HE) Agar: On hektoen enteric agar, salmonellae produce transparent green colonies with black centres (except S. paratyphi A, whose colonies do not have black centres). Eosin Methylene Blue (EMB) Agar: Non lactose fermenters, including Salmonella, Shigella and Proteus forms colorless or transparent colonies. S.Typhi forms large black colonies with a metallic sheen. S.Paratyphi A produces green colonies due to absence of H2S production. Selenite broth or Tetrathionate broth: For the enrichment of Salmonellae present in faeces. Faeces is incubated for 12-18 hours before subculture into plates. Trypticase soya broth or Brain Heart Infusion broth: Non-selective broth for primary blood culture. Voges-Proskauer (VP)-negative (media; MR/VP Broth). one of the best student learning and review webs by far…..SPECIFIC to the point and NO JUNK thrown around to fill in space !!! I like this site for precise and specific facts about microbes. If we incubate any bacterial pure culture like E.coli,B.cereus,P.aeruginosa more than 16 to 18 hours. What is the impact of it on the survival of the culture. Sor… I love so much to do culture to the stool sample fo s. Typhi and other diseases, urine fo the chronic U. T. I and H. V. S…, so can help me to get clear whole procedure,result and how to treat the infection of a such diseases. Can you please let me know for standard environmental swab samples in poultry production should enrichment broth be used or dry agar according to ISO 6579:2002 amended 2007. It would seem the method involving enrichment broth prior to the amended standard would likely find salmonella and is not appropriate and is why the amended 2007 version as I understand it does not use enrichment. I would be grateful if you could clarify what is the correct test method. Thank you. I like ur site.. .havng some confusion? ?